Enabling works are now underway at a major new housing development by Cala Homes in Penicuik. Proposals from Cala Homes and Avant Homes to build at Mauricewood, to the north of Penicuik, have been unanimously supported by the planning committee of Midlothian Council. In total, the project will see the creation of 389 detached homes, 20 semi-detached and 39 terraced houses, with a further 44 cottage flats and 52 flats in three-storey blocks. 120 (22%) of the 544 new homes will provide affordable housing. Derek Lawson, Land Director at CALA Homes, said: “Enabling work has now started at the site and we’ve issued letters to locals to let them know more about the plans. 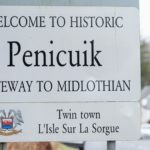 We’ve worked closely with the local community over many years to ensure that these plans meet the need for new homes while also benefitting the people already living in Penicuik. “The development is a very real investment in Penicuik. It will significantly benefit the town’s infrastructure, helping to improve schools, roads and local facilities. Meanwhile the local economy will also benefit, bringing valuable new custom to local businesses. The housebuilder has pledged £15.7m towards the creation of new infrastructure, such as schools and leisure facilities across the county, as well as an estimated £15.6m boost to the local economy with the creation of more than 290 jobs. The strategy for the site is to make the most of easy access to the existing transport network, while new access routes will also be developed to ensure the smooth flow of traffic. The development will be phased between CALA and Avant Homes to minimise disruption and provide a mix of housetypes from an early stage.